Turbie Twist® is the Original Super Absorbent Twist and Loop hair towel that Stays in Place! Featuring a unique tapered design, the Turbie Twist® allows for a perfect fit on all head sizes making it great for Kids and Adults! The lightweight design also reduces neck strain. Through savings in laundry and blow drying time the product practically pays for itself. Less blow drying = healthier hair! I use my Turbie Twist daily! It's just a part of my shower routine now. I used to wrap my hair in what ever shirt I was wearing to try and cut back on washing so many towels. I knew that was kinda gross, but I was sick and tired of all the towels I was having to wash - one for my body & one for my hair. The Turbie Twist has saved me from that habit. I received a two pack so I just hang them on the towel hook and I always have one dry & ready. Because they only get exposed to my clean hair, I don't have to wash them much at all. The Turbie Twist is absorbent & easy to use. I really like mine! One lucky winner will receive a Turbie Twist 2 pack! *Follow me @jamaise at Twitter & Tweet this : RT @jamaise #GIVEAWAY #WIN - a Turbie Twist Hair Towel Wrap 2 pack! http://bit.ly/hPAixd Ends 1/10 tweet each day for one entry each ! Disclaimer: Turbie Twist provided me with a free sample of this product to review, and I was under no obligation to review it if I so chose. Nor was I under any obligation to write a positive review or sponsor a product giveaway in return for the free product. These views are my own. Would love to win because I wash my hair everyday & love hair towels like these! I would love to win this for my teen daughter - she uses at least 3 towels per shower and walks around with a heavy towel on her head for hours! I love that this is lightweight. I would like to win this so that I don't have to use a heavy towel to wrap around my hair when it is drying. I would love to win because my daughter has long hair & she cold really use this for after we wash it. 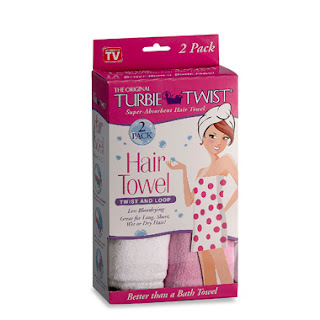 I'd like Turbie Twist because towels are too heavy and don't dry my hair well. Then I freeze. I would love to win because I have long hair and I often am unable to dry my hair after washing it because the kids just don't give me that much time. I would like it as it stays in place. Follow with GFC! and i would like to win to see if it would hold my thick hair! I am a friend. I would love not to have to use a big towel for my hair. It's a lot to wash as opposed to a small hair towel. I'd love one of these to keep my wet hair out of my face until I go to dry it. #1 I Follow your blog via Google Friend Connect as nightowl. #2 I Follow your blog via Google Friend Connect as nightowl. #3 I Follow your blog via Google Friend Connect as nightowl. #1 Follow you via Networked Blogs. #2 Follow you via Networked Blogs. I entered your Miraclejeans giveaway. Entered Thomas & Friends giveaway. I would love to get this for my daughter who refuses to use a hair dryer and goes through two towels a day from washing her hair. We run out of towels constatntly when she does this. I'd like to win a Turbie Twist because my my twist towel that I have owned for a few years broke this past week :( I became a friend because I love your review on Chinch! #1 I am a fan of TurbieTwist on Facebook as Heather ArmyWife. #2 I am a fan of TurbieTwist on Facebook as Heather ArmyWife. #1 I follow you via Google Friend Connect as Goss Family. #2 I follow you via Google Friend Connect as Goss Family. #3 I follow you via Google Friend Connect as Goss Family. #1 I follow you via Networked Blogs as Heather ArmyWife. #2 I follow you via Networked Blogs as Heather ArmyWife. I also use an extra towel to dry my hair...I'd love to try this. It seems like a great product. Thanks! I'd like to win because I wash my hair daily and I think this will be gently then using the large bath towels. i would love to try one of these...they look like they would be so much easier then using a large towel. Like you, I hate washing so many hair towels. I wash my hair daily, so I go through alot. I'd love to win this!